With the CliniMACS Prodigy T Cell Transduction Process you can now generate gene-modified T cells in a simple and fully automated fashion. Easy to use, this unique process will surely change the way you work. Comparison of expansion rates of human T cells with TexMACS Medium, a competitor product and serum containing basal medium (RPMI + 10% FBS) after 14 days of expansion using the T cell Acitvation/Expansion Kit. 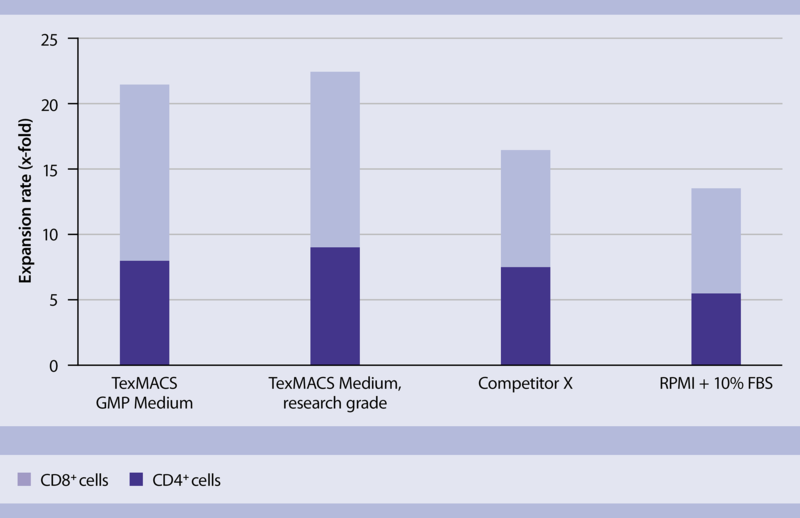 Comparison of expansion rates of human T cells with TexMACS Medium, a competitor product and serum containing basal medium (RPMI + 10% FBS) after 14 days of expansion using the T cell Activation/Expansion Kit. Join Dr. Anne Richter and her webinar on new developments for translational and basic T cell research, including workflows for mouse CD4+ helper cell differentiation, human T regulatory cells, and flow cytometric tools for sensitive and rare cell analysis.